So, what is your word? or theme? or focus this year? Thanks for including me even though I don’t really have just one word. 🙂 I appreciate you! Friend… your theme is so all encompassing… it fits PERFECT into all of this… And I love how intentional you will be this next year about sharing your faith journey 🙂 can’t wait to see what God does! You are wonderful!! Thank you for doing this!! it is so encouraging… to see everyone’s words and how God has weaved them together – and US together to encourage each other…. This has been so cool! I know!!! Alece already has 107 people on her link-up: http://www.gritandglory.com/2011/01/01/look/ AMAZiNG!!! 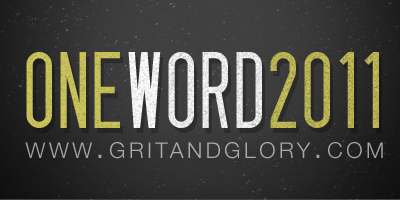 And #OneWord2011 is out of control on Twitter – love it! Can you believe how big it’s getting?! So cool!! so glad you posted on this – I knew your hubby’s blog, but I didn’t know your site Amanda, yay – you are included! So cool to see so many people doing this…so many great words..can’t wait to see each word weaves through this year for each of us. I know – it is SO cool! Wow. Thank you for the link up. Hi jenny. My word for 2011 is EMBRACE [who I am]. Thanks for visiting my blog and sharing the OW2011 link!